One of the World Heritage sites on the UNESCO's World Heritage List is the Old Town in Tallinn. The Old Town was built in the 1100s and has a long history of wars and invasions. Throughout the years, the city has had everything from Soviet rule to a visit by the Nazis during World War II. Despite its long history, the Old Town is extremely well preserved and you can’t help but be fascinated as you wander around here. What is also special is that it is not only teeming with tourists but has also pushed locals when it comes to the constant creation of life and movement in the district. The medieval building makes the Old Town very compact and you can therefore quickly get an overview. For those who wish to, there are guided tours where you can learn all about the ancient history of the city. Inside the old city you will find St. Olaf's Church. This church dates back to the 1100s and in the 1500s was a 159 metre high steeple. The church tower was built to make the church the world's tallest building from 1549 to 1625. The name of the church actually comes from the Norwegian king Olav the Holy. Today the church is only 123.7 metres high due to the tower spears being destroyed in a fire in 1625. Tallinn is very well known for its variety of spa treatments that have long attracted people from all over the world to the city. Above all, the spas offer massage and treatments with aroma oils. If you want to have a spa treatment and also make a small excursion, you can visit the coastal town of Pärnu. Pärnu is located about two hours by car or bus from Tallinn and is a centre for various kinds of cure treatments. Anyone who fancies some après-ski feeling while tasting Estonian beer can visit The Beer House in the old city. It’s crowded with tourists and locals alike to the sound of the classic "après-ski music." It also has Tallinn’s only mini-brewery that offers various home-brewed beers. The beer brewed here has won several awards and should definitely be tasted by those who want to discover new beer flavors. When visiting Tallinn, there are great opportunities to taste food from the Estonian cuisine. There are several restaurants offering typical Estonian food, and one of these is Eesti Maja. At Eesti Maja, you can eat traditional favourites such as marinated eel, Baltic sprats with bacon, blood sausage and much more. During the week, this restaurant has a small lunch buffet that offers a chance to taste different Estonian dishes. Neeme Lall is an Estonian artist who has been called "the last Mohicans of '60s flower power" and his paintings are very hippie-inspired. The paintings are extremely violent and are often done in just a few minutes. Some paintings took only thirty seconds, but despite the short time they took to create, they’ve become really fascinating pieces of work. Neeme Lall says that the inspiration for the paintings will always be in the "emotional explosions" and it is therefore perhaps not surprising that iy only takes a moment for him to paint. For a visiting tourist who wants to see something a little different in Tallinn, his gallery is well worth a visit. The KGB Museum tells a lot about Estonian history and what it was like to be part of the Soviet Union during the 1900s. It is full of interesting information about the future of Estonian society and the constant monitoring that the population was exposed to. Visitors should take a guided tour and also watch a film about the KGB and how they operated in Estonia. Wherever you go in the museum you will come across a number of different artefacts such as radios and other technical equipment that the KBG used. You also get the opportunity to see what the rooms that the KGB worked in looked like. The museum is located up on the twenty-third floor of the Hotel Viru, which was the hotel that the KGB used as its monitoring centre during the Soviet era. Thanks to the high altitude, you’ll get a really nice view of Tallinn as well as all your new-found new knowledge about the KGB. Whether you’re interested in art or not, an hour or two at The Kumu Art Museum can be an interesting and enjoyable experience. Kumu is Estonia's largest art museum and there are a total of five levels to explore. The building's modern architecture is fascinating and is in itself an attraction. The museum was opened as recently as 2006, and in 2008 the museum was awarded the "European Museum of the Year". The art on display is very diverse with different artists and exhibitions, but the focus is primarily on Estonian and modern art. The different floors follow a timeline where you can see art until the end of World War II, art from the Second World War until 1991 when Estonia was occupied by the Soviets, and art from 1991 until today. The various exhibitions change all the time but often contain modern art from Estonian and international artists. If you bring children to Tallinn, then a few hours at Skypark can be a real hit. Skypark is like a small playground with several trampolines and obstacle courses. There are also several games, the opportunity to sumo wrestle and a range of other attractions. Whatever the age of the children, chances are that they’ll find something to enjoy. Adults must accompany free of charge and can hang out in Skypark’s café while the children get rid of their excess energy. To get here from the centre of Tallinn costs about five euros by taxi. The Occupation Museum tells the story of the time during the two occupations between 1939-1991 which Estonia was subjected to. Visitors should understand how the German and Soviet occupation affected the nation and the impact it had on people. With pictures, films and audio playbacks, it is easy to form an opinion about the suffering Estonia suffered during the occupation. The feeling is eerie when you hear and see everything from eye witnesses' stories to the propaganda that the Estonians were constantly listening to. There are also many different objects such as Soviet statues, posters and much more. After wandering around the museum, it is hard not to be affected by what is displayed. After running around in the central part of Tallinn, it might be nice to have a change of scenery and relax among some greenery. An excellent place to visit for this purpose is the Open Air Museum Rocca al Mare, which is a great outdoor park with various old Estonian buildings. When you walk around, it is easy to feel that you’ve taken a trip back in time when the environment is thought to mimic the way Estonian society looked in the past. If you have the opportunity, make sure you bring along a picnic and eat in one of the park's big oaks. If you want to keep any memory of this outdoor museum, there is a small shop where you can buy various handicrafts and other traditional Estonian objects. Whoever likes action-packed experiences should not miss a visit to the 1,000 square metre Tondi Shooting Range, which is located a little way away from the city centre. Here you’ll get the chance to test your shooting skills with a variety of weapons and at the same time experience a real adrenaline rush. On site there are skilled instructors to help you to shoot in a safe manner. Everyone is welcome, and the instructors are there so you do not need to have any previous experience of using firearms. It is possible to come here spontaneously, but if you want to be absolutely sure you'll be able to shoot, you should book in advance. When visiting a large city like Tallinn, it's nice to get to a place where you can look out over the city and its vicinity. One of the best places to visit to get a nice view of Tallinn is Toompea. 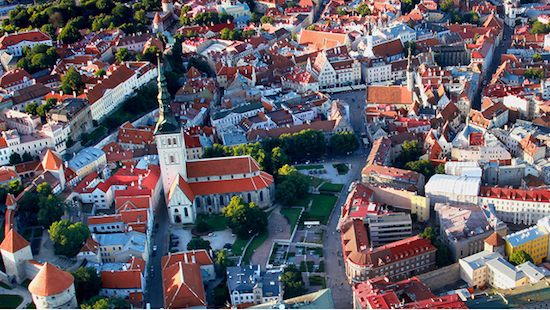 Toompea is part of the Tallinn city centre and has an interesting history that stretches back to the Middle Ages. These include the Russian Orthodox Alexander Nevsky Cathedral and the large Toompea Castle, which was built 800 years A.C. and is today the Estonian Parliament building. To learn more about the history of Toompea, it is possible to go on guided tours. If you are just looking for a fine view, it is a good idea to come here in the evening to watch the sun go down behind Tallinn. Anyone fascinated by history and wanting to gain more knowledge about Estonia and the period when the country was a part of the Soviet Union must not miss a visit to Patarei. Patarei is an old prison that was used during the Soviet era to imprison various criminals and political opponents. As a visitor, you’ll get the chance to go into the prison's various components and explore everything from dining to the different prison cells. If you want to, you can take a guided tour in order to get an in-depth story about what it was like to work and be imprisoned in Patarei. If you have a guide, you usually also get the chance to see parts of the prison that are otherwise not accessible to normal visitors. Make sure not to come in short sleeves since most parts of the prison can easily feel cold. Also remember that what you experience inside the prison can be perceived as quite scary and small children should not tag along.